In a world where startups have become the #1 driver of economic growth and job creation while large corporations continue to cut down on their workforce, Hong Kong cannot afford to rest on its past achievements and legacy industries. Furthermore, as software has become a building block for all other innovation sectors such as biotech, nanotech, life sciences and clean technology, tech startups have not only become an important growth sector, but also a strategic one. Hong Kong is fully capable of successfully developing a strong tech startup ecosystem. 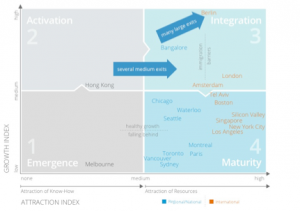 Hong Kong has as many, if not more, strengths and strategic assets to build on than several of the top 10 ecosystems. In fact, it possesses vastly more resources than the rest of the top 20 ecosystems. Furthermore, Hong Kong has been growing so fast that only five of the top startup ecosystems are growing as fast or faster. Clearly Hong Kong is on the right path and can be encouraged by its results. The Hong Kong SAR consists of 7.3 million people and is one of the most densely populated areas in the world, with 6,600 people per square kilometer. In the international business world, Hong Kong is widely known for its ease of doing business, sound legal environment, and advantageous geographical location. According to the Heritage Foundation, Hong Kong has ranked first globally in terms of its economic freedom for 21 consecutive years (1995-2015). Hong Kong has several key strengths, two of which confer a competitive advantage to local startups in two fast growing tech sub-sectors: FinTech and IoT. First, it is one of the most important international financial centers in the world, alongside New York, London, and Singapore. This gives FinTech startups access to top decision makers who are representative of global B2B customer needs, and deep industry expertise informing the development of new business models that address global B2B and B2C customer needs. Secondly, the proximity of China’s Pearl River Delta, including Shenzhen, with its globally competitive (if not leading) hardware prototyping and manufacturing capabilities, provides a strategic growth opportunity for Hong Kong’s IoT and wearables startups. Like any startup ecosystem, Hong Kong also has challenges. The World Economic Forum’s Global Competitiveness Report defined the city’s main challenge as the need “to evolve from one of the world’s foremost financial hubs to an innovative powerhouse. Innovation is the weakest aspect of the economy’s performance”. Furthermore, the Global Entrepreneurship Development Institute (GEDI) ranked Hong Kong #40 worldwide on their 2016 Global Entrepreneurship Index, dropping from #30 in 2012, despite efforts made during the past five years to promote and support entrepreneurship. The analysis of Hong Kong’s startup ecosystem according to Compass’ Ecosystem Lifecycle Model points to the fact that it is at the early phase of development called Activation. In combination with Compass’ input Factor gap analysis, it is the central structure used to understand Hong Kong’s ecosystem challenges and frame solutions. 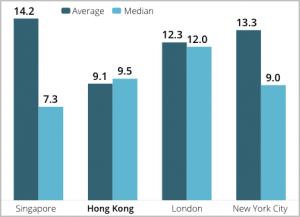 Hong Kong’s early stage of ecosystem development partly explains the lower average founder age measured by the Compass survey (Fig. 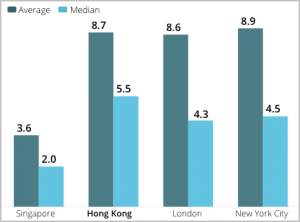 1), and low proportion of (older) serial tech entrepreneurs. Interestingly, there are much fewer women founders in Hong Kong than in other ecosystems (Fig. 2). Characteristics and challenges typical of startup ecosystems at the Activation phase are all present in Hong Kong. In this phase ecosystems grow healthily through a process called “Catch Up Growth”. Specifically for Hong Kong, its entrepreneurs are just starting to catch up to global know-how through interactions with global stakeholders from the world’s top ecosystems. Through this process local stakeholders increase the productivity of local resources by learning global best practices specific to tech startups, such as the latest business models, what constitutes up-to-date global opportunities, and Steve Blank’s Customer Development methodology. The Activation phase is also characterized by a low attraction of resources such as startups, talent, capital, and investors from top ecosystems. This means except for resources inherited from an economy’s other industries, an ecosystem in this phase is fraught with resource gaps that need to be addressed by the concerted efforts of its local stakeholders. Together, resource gaps and the lack of global know-how hold back the development of an ecosystem and production of globally-leading startups, unicorns, and large exits that trigger an ecosystem’s progression to the Integration phase. At that phase an ecosystem starts attracting external resources, which help close its factor gaps and accelerate its growth. In summary, because tech startups are essentially a recent phenomenon, and in the absence of large exits motivating its local youth to pick startups as a career path, Hong Kong contends with gaps in technical talent and entrepreneurial activity. The lack of exits also translates into a gap in active tech angel investors. Together with the lack of global know-how of its entrepreneurs—typical to ecosystems at an early phase of development—those gaps explain its lower Ecosystem Performance. Hong Kong’s Ecosystem Value is $2.8 to 3.5 billion (Fig. 5), well below that of Montreal and Vancouver (ranked #20 and #18 respectively), despite their much smaller populations and similar number of startups (in the low 2,000s). 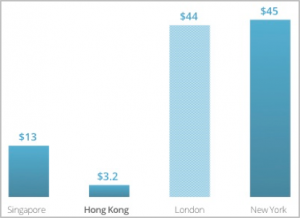 Compared to that of Singapore, Hong Kong’s Ecosystem Value is about four times lower. Performance issues are further illustrated by a few other metrics. Hong Kong’s low exit value (total exit valuations of $1.4 to 1.7 billion), complete lack of unicorns, and exits above $1 billion, and the total valuation of all its pre-exit tech startups of $1.5 to 1.8 billion—less than one sixth that of Singapore. Meanwhile, Hong Kong’s Startup Performance, i.e. 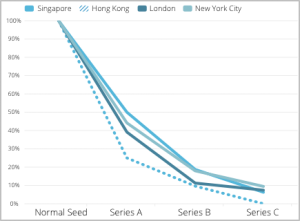 the growth of its startup valuations over time, is one-third that of New York (Fig. 6). Typical of the Activity phase, Hong Kong is growing rapidly from a small base. Its Growth Index is 3.0, which matches the 5th fastest growing ecosystem among the top 20, Amsterdam. This is due to Hong Kong’s growth in number of startups and Exit Value, and despite a 21% reduction in VC investments. Hong Kong has a seed funding gap, more specifically a lack of active angel investors. 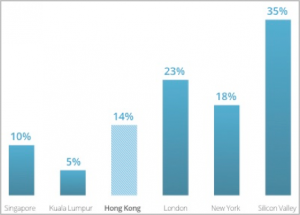 It becomes clear when looking at the proportion of startups obtaining a “normal seed” round, which is less than half the proportions found in Singapore and New York City (Fig. 7). Unlike other ecosystems at the Activation phase, Hong Kong’s institutional venture investors are already caught up to global know-how. This is because they actively invest in startups from top ecosystems, using Hong Kong as an Asian headquarter. For this reason and because of its long-held position as a leading international financial center, Hong Kong does not have a funding gap with regards to Series A or B rounds. This conclusion is supported by funding amounts and the attrition funnel to Series B (Fig. 8, 9, 10). Likewise, while there is a scarcity of late-stage funding events, it is not due to a funding gap but to the lack of high potential late-stage startups to invest in. Hong Kong’s early-stage startups show great results in reaching foreign customers, with a higher percentage than that of all top 20 ecosystems (Fig. 11 above), except Tel Aviv (74%). Contributing factors include its relatively small market and its long-held position as a global trading center, which has led to the development of global sales and marketing expertise and other positive attributes. However, as demonstrated by the scarcity of Series C and D funding events in the last few years, Hong Kong startups’ entrepreneurs and teams have yet to build the skills and know-how specific to tech startups that are required to develop and capture global market opportunities. Hong Kong is fraught with a Talent gap, specifically as it relates to startups having difficult to access high-quality technical talent. While Hong Kong does have quality talent, the best graduates favor high-paying and secure jobs in large companies, instead of the demanding and high-risk jobs offered by startups. Hong Kong startups also have difficulty compensating for the local talent gap through immigration, by attracting foreign technical talent from mainland China and elsewhere. 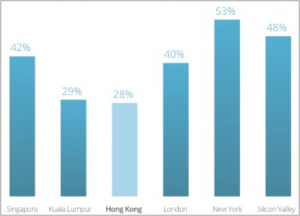 Being an early-stage ecosystem at the Activation phase, it is not surprising that Hong Kong has a low level of Startup Experience, significantly lower than Singapore. For instance, Hong Kong’s technical talent lacks prior experience in startups (Fig. 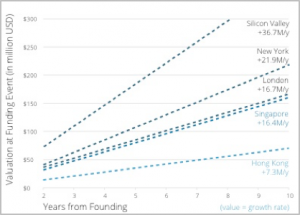 12) while its founders lack experience in hypergrowth startups (Fig. 13). Startup Experience is a factor that improves slowly as an ecosystem matures and accumulates successful exits. 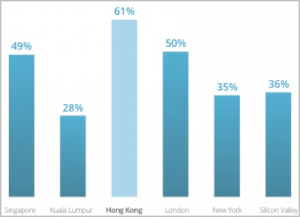 According to the research by CITIE, Hong Kong falls within the third quartile of the analysis—the Builders peer group. Builder cities have begun to actively incorporate innovation and entrepreneurship into their municipal policy development. Among its peer group Hong Kong is leading in the City as a Strategist policy role, but generally behind its global peers and Singapore in other roles (Fig. 14). Because of its technical Talent gap, Hong Kong’s immigration policy is of primary importance. Most experts regard immigration policy as one of the top barriers to the growth of its startup ecosystem. 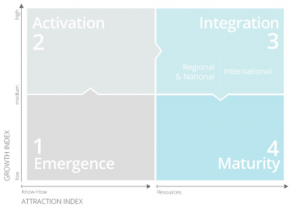 Ecosystems at the Activation phase must invest in Catch Up Growth activities whereby they attract global know-how by fostering interactions between local and global stakeholders. Accordingly, Hong Kong’s #1 priority is to help its entrepreneurs catch up to global know-how. (As discussed earlier, investors do not need catch up.) Until then, its startups will be at a disadvantage—staying generally behind startups from top ecosystems and their rapidly evolving business models and technologies that address large, global market opportunities. Therefore, Hong Kong startups are left to work on smaller, local opportunities, producing slower growing revenues that do not deserve large amount of late-stage capital and lead to fewer and smaller exits. Other priorities include closing its factor gaps, specifically: improving its startups’ access to high quality technical talent; reducing its seed funding gap; picking and executing sub-sector strategies (e.g. FinTech and IoT); and instilling a mindset change to increase entrepreneurial activity. The objective is to diversify Hong Kong’s economy and ensure long term prosperity by aggressively investing in the growth of its tech startup ecosystem. This can be achieved by developing a strategic plan that integrates some of the programs recommended in the Hong Kong Startup Ecosystem Report, and building consensus for concerted actions by its stakeholders. Once consensus is established among local stakeholders around strategies and tactics to be implemented, different stakeholders can lead or participate in taking action. The role of the government is to coordinate efforts, facilitate the activities performed by private entities, and invest or otherwise promote activities related to a specific Factor gap. The latter is very important because several of its challenges cannot be addressed directly by the private sector. But once an ecosystem is mature, regular large exits motivate youth to choose technical degrees and become tech entrepreneurs, as well as produce high-net-worth-individuals who become active tech angels. Until then government efforts are crucial. Recommended strategies, tactics, and programs are relevant to all small and medium-sized ecosystems at an earlier stage of development. This issue is complex and cannot be resolved overnight. It is the object of many tactics detailed in the report. The set of short-term solutions includes attracting global accelerators to Hong Kong and developing special access to overseas accelerator programs for Hong Kong startups in top and strategic ecosystems (e.g. Silicon Valley, New York City, London, Singapore, Beijing, and Shenzhen). Global accelerators are one proven solution. They teach up-to-date know-how and global best practices to entrepreneurs—which is exactly what Hong Kong needs. Furthermore, accelerators play a special role in the ecosystem (or industry cluster). “Porter argues that economic activities are embedded in social activities; that 'social glue binds clusters together'.” Accelerators act as the professional and social glue, enhancing the relationships between startups and local investors, corporations, and thought leaders interested in their programs, for instance through demo days. Because many of those local stakeholders possess global know-how, accelerator activities help entrepreneurs catch up in more ways than one. While several other programs address this issue, short-term solutions can start with increasing immigration by young graduates from countries with top quality technical talent. Good targets include Russia, former Soviet Bloc countries, and Eastern Europe, as well as mainland China. Hong Kong has much to offer to technical talent from any of those countries: a more cosmopolitan culture, economic freedom, and interesting social activities attractive to youth from all these countries; greater assets on which to build IoT startups (except vs. mainland China) and FinTech startups; and a stronger startup ecosystems (except vs. Moscow and mainland China). Foreign technical talent can also have a positive impact on Hong Kong’s entrepreneurial activity. First, because some of this technical talent comes with the desire to found a startup, and second, because immigrants in general have a much higher propensity to become entrepreneurs. One of the best ways to close a seed funding gap is to implement a matching funds program, because it directly increases the capital available to seed rounds, which in turn leads to more startups getting funded. Matching funds may obtain capital from both public and private sources, such as large corporations, investor groups, or associations. The Hong Kong government’s recent Policy Address set aside $2 billion to set up a fund for co-investments on a matching basis. Because Hong Kong’s ecosystem does not have a funding gap at the Series A and B rounds, nor at later funding rounds, these funds would benefit from reserved exclusively for seed funding, including funding by “Super Angel” firms. Passing the management of matching funds to several formally organized groups of private angels—each under the guidance of an experienced fund manager—provides many benefits. For instance, it builds up angel investment expertise in the community. Additionally, by creating some competition between funds and allowing them some investment discretion, it helps direct the capital towards the most promising startups. Startup ecosystems at any stage can grow faster by riding the wave of a fast-growing tech sub-sector. Silicon Valley certainly did this with the tremendous growth of social networks into their own large, specialized sub-ecosystems of apps, technologies and services. While an ecosystem cannot bet on having the most important unicorn in a sub-sector, making strategic commitments in sub-sectors that are widely predicted to experience dramatic growth in the next five to ten years can provide some degree of leadership and have a powerful impact. Hong Kong’s strengths support the selection of IoT and FinTech as sub-sectors in which to make long-term strategic commitments. Certainly both of them are generally accepted as having high potential for hypergrowth in the next five to ten years. Such strategic commitments would have to be made in the short term in order to seize leadership. As Allen Ma, Chief Executive Officer of HKSTP, noted, “The next few years will be key for Hong Kong’s development into an IoT hub”. The same applies to FinTech, considering that other ecosystems are already positioning themselves for such leadership. This would mean dedicating a portion of the budget and efforts allocated to Hong Kong’s various innovation programs to IoT and FinTech. As Singapore discovered 15 years ago, an ecosystem cannot thrive without closing its gap in entrepreneurship levels. While it is difficult, committed efforts can have a measurable impact on entrepreneurial activity within a period of ten years. The make up of effective programs are generally known and information on them is widely available. As noted above, reducing the talent gap through immigration can also have a positive impact on entrepreneurial activity. 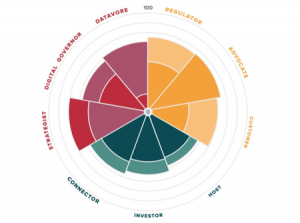 While Hong Kong is behind the top 20 ecosystems in terms of performance and several input Factors, it benefits from more assets and strategic strengths on which to capitalize than most. Its potential is just starting to be realized, as shown by its recent growth, which matches the fifth fastest growing ecosystem among the top 20. There is no doubt that concerted efforts by its stakeholders can address its key challenges and further accelerate the growth of its tech startup ecosystem along with producing globally leading startups and unicorns. In keeping with Silicon Valley terminology, tech startups and the tech sector refer to software, web, mobile and e-commerce startups.